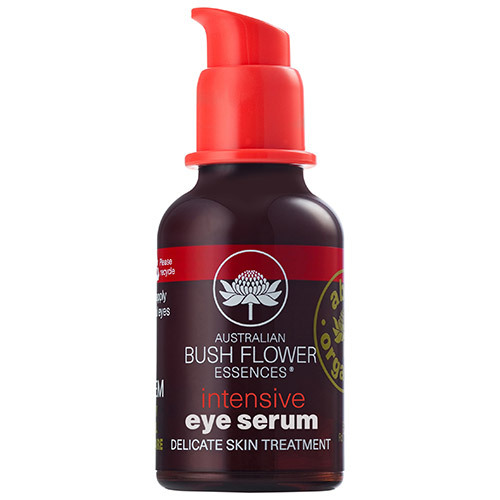 A gentle yet intensive organic eye beauty treatment containing Australian bush flower essences and rose stem cells to care for delicate skin tissue around your eyes. This exquisite organic formulation nurtures, rehydrates and refreshes tender skin with nature’s antioxidants and stem cell ingredients. Excellent for reducing the appearance of fine lines and wrinkles, whilst gently soothing dark circles, redness and puffy eyes. Leaves the area around your eyes feeling smooth, supple and radiant. Billy Goat Plum, Crowea, Five Corners, Flannel Flower, Mulla Mulla, Old Man Banksia, She Oak, Wisteria. Organic Aloe baradensis leaf juice, Aqua (Water), Coco-caprylate*, Organic glycerin, bentonite (clay), glyceryl stearate citrate*, cetearoyl alcohol*, glycerin*, Planchonia careya essence, Crowea saligna essence, Banksia serrata essence, Casuarina glauca essence, Wisteria sinensis essence, sodium anisate, Organic Eremophila longifolia (Emu Bush) extract, Organic Santalum acuminatam (Quandong) extract, Organic Solanum aviculare (Kangaroo Apple) extract, Ginkgo biloba extract, Althaea officinalis (Marshmallow) root extract, Chamomilla recutita (Matricaria) flower extract, Organic Olea europaea (Olive) leaf extract, Organic Arnica montana flower extract, Organic Hypericum perforatum (St. John`s Wort) extract, Organic Rosa canina (Rosehip) seed oil, Organic Oenothera biennis (Evening Primrose) oil, Pelargonium graveolens (Rose Geranium) flower oil, glyceryl caprylate*, tocopheryl acetate (Vitamin E), Organic Macadamia integrifolia seed oil, sodium stearoyl glutamate*, Organic Helianthus annuus (Sunflower) seed oil, xanthan gum*, sodium levulinate*, citric acid*, citronellol^, d-limonene^, geraniol^, linalool^. Below are reviews of Australian Bush Flowers Intensive Eye Serum - 30ml by bodykind customers. If you have tried this product we'd love to hear what you think so please leave a review. Amazing little brown bottle of wonder! This cream got rid of my slightly puffy eyes and slight dark circles. It smells divine and really really does smooth out those little lines under the eyes.